Welcome to Just Ahead’s Joshua Tree Trip Planner—our guide to everything you need to know to plan your trip to Joshua Tree National Park. 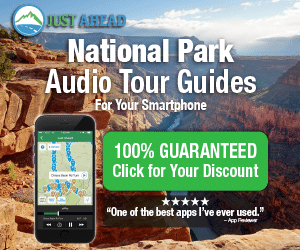 Click here to see the complete series, and be sure to download our Just Ahead smartphone audio tour of Joshua Tree before you head to the park. What do you need to know to plan a trip to Joshua Tree National Park? We happen to be experts on this topic, as we’ve been visiting the park regularly for decades. And we’ve been venturing out there a lot lately to research, write, test, and double-check our Just Ahead tour of Joshua Tree National Park. Joshua Tree is easy to get to, easy to drive through, and always a pleasure to visit, especially with Just Ahead’s narrated audio tour playing on your smartphone. But it is also a remote desert area. That’s what makes it a compelling place to visit. But at the same time, a visit to Joshua Tree requires smart planning. So it helps to have an insider’s take on trip preparation, where to stay, where to camp, and so on. When to visit Joshua Tree National Park? Anytime! Joshua Tree National Park is a year-round destination with four distinct seasons. Always come prepared for the unexpected. Weather in the desert can be fickle. Spring wildflowers in Joshua Tree National Park? Actually, this is September. A summer of occasionally heavy thunderstorms laid a carpet of chinchweed on the desert floor. Spring—March through mid-May—brings delightful weather, with warm sunny days and cool nights, as well as carpets of wildflowers. It’s the most popular time of year in the park. If you’re visiting the park on a weekend be sure to arrive early on Friday—or even Thursday—to get one of the first-come, first-served campsites. Or you can reserve ahead at www.recreation.gov. This post is part of Just Ahead’s Joshua Tree Trip Planner—our guide to everything you need to know to plan your trip to Joshua Tree National Park. Click here to see the complete series, and be sure to download our Just Ahead smartphone audio tour of Joshua Tree before you head to the park. How much time do you need to spend in Joshua Tree National Park? If you only want to see it from your car window, you can cover the park’s major roads in three or four hours. You’ll certainly get a sense of the park, especially if you have Just Ahead along for the ride. Remember, Just Ahead is our smartphone app that provides a narrated audio tour of the park. But if you can, allow time to get out and explore a bit. If you have a full day to visit the park, arrive early in the morning and stay at least till dusk. That way you can either . . .
How Do I Prepare for a Trip to Joshua Tree? You lose moisture from your body in the dry desert air no matter what the temperature is or how active you are, which is why dehydration is a year-round concern. The solution is simple, of course—carry and drink plenty of water. Drink regularly, even if you’re not thirsty. You’ll need at least a gallon per person per day—twice that if you plan to bike, hike, or climb. Carry water with you whenever you leave the car. Remember, water is available only at Black Rock, Cottonwood, and at the Indian Cove ranger station, so stock up before you venture into the heart of the park. How Do I Get to Joshua Tree? There’s nothing like spending a night or two in Joshua Tree National Park. The nearby motels and inns are fine (click here for advice about where to stay), but they’re not in the park. And nighttime in Joshua Tree is special. The sky is almost always clear, so the star show is dazzling, particularly in the campgrounds farthest away from the glow of city lights: Belle, White Tank, and Cottonwood Spring. No matter where you camp, sunset and sunrise are almost always dramatic. You’re likely to hear coyotes yipping and howling at night, and you’ll wake up to the dawn chorus of singing birds. Much as we love camping in Joshua Tree National Park, sometimes a roof and creature comforts are in order. The towns near and adjacent to the park offer everything from inns with character to traditional motels to quirky joints that don’t fall into any category. Naming the top 10 best sights in Joshua Tree National Park is like naming your favorite child, because we love every sandy, rocky, scrubby, wildflowery acre of Joshua Tree. But here we go anyway: a selection of our favorite places described in the Just Ahead tour of Joshua Tree National Park. Note: These are not in any particular order. Because remember, we love them all. Summer or winter rains bring an ephemeral lake to Joshua Tree at Barker Dam. We here at Just Ahead are excited to announce the launch of our first iPhone-powered GPS audio tour. Our debut guide takes you on a professionally narrated audio tour of Joshua Tree National Park in Southern California. It’s available for download now in the Apple App Store, and an Android version is coming soon. Maybe we’re a little biased, but we love how the app works: Once you download it, you simply open the app, and we begin guiding you to and through Joshua Tree National Park. We point out landmarks along the way, and all the coolest places to visit. By the way: Just Ahead’s Joshua Tree is a GPS audio tour. In other words, you don’t need a mobile phone signal or an Internet connection. The app uses GPS to know exactly where you are in the park. It even knows what direction you’re traveling. Once you start the tour, a friendly, informative tour guide begins narrating your travels.